Hi everyone! Right now the store is a bit small but I’m working on translating more of my books into english soon! If you’d like to take a look at the hebrew version of the store, with all the additional things in it just click here. Imported Hobos, Robots that sell velcro, and candy stores that bend the fabric of space and time! 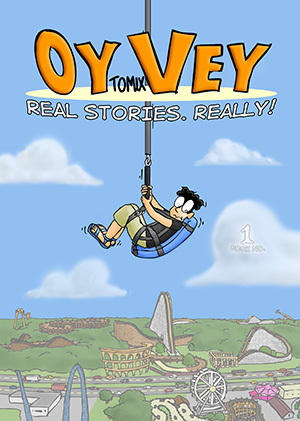 Tomix proves truth is stranger than fiction in this collection of bizzare or funny stories from his life in Israel, including several tales from his 2010 U.S. rollercoaster trip with a group of theme park enthusiasts!